Synopsis, Our Opinion: OUTSTANDING rich and lively Chardonnay that’s an excellent value. 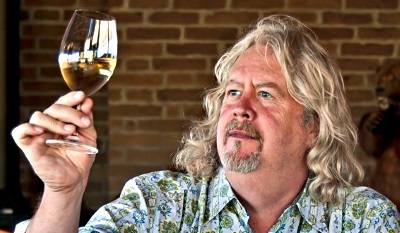 Producer/Winery: Jim Clendenen; Au Bon Climat; Santa Maria, California. Geographic Appellation: Santa Barbara County; Central Coast, California. Purchased From: Au Bon Climat tasting room, Santa Barbara, California. Paired With: Chicken cooked with potatoes, tomatoes, green bell pepper, onion, celery, and cabbage, seasoned with soy sauce. Chilled before drinking. Dark oat straw color. Strong pear, apple, melon and vanilla aromas with whiffs of cinnamon. Silky smooth, slightly creamy, rich, full body and a 200-grit texture. Lively Bartlet pear and tropical fruit flavors with just a tad of citrus and vanilla and a persistent taste of butter. Fresh with brisk acidity and a light mouth-feel in spite of the rich creaminess. A great mineral finish that really gives it character. OUTSTANDING rich and lively Chardonnay that’s an excellent value. Photo from Au Bon Climat. 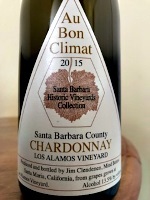 Comments: Learn more about Jim Clendenen and his Au Bon Climat wines. See all our reviews of Au Bon Climat wines.